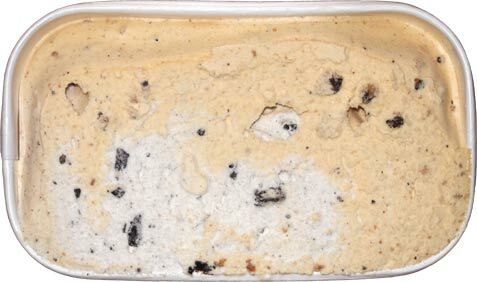 I scrape the lid and I will give Breyers this positive note: Chips Ahoy in caramel ice cream is a good idea. We just need someone to do it with real ice cream, preferably in the super premium range. I will then completely take Breyers back down several pegs by commenting on how terrible their Oreo cookies and cream flavor is. So fake and disgusting. Bleck. I want to like it because there are respectable (if not gigantic) Oreo wafer chunks mixed in. The food science on the back end is just terrible though. I don't even want to eat it. As you can see, the two flavors are swirled meaning it's going to be harder to eat out the more interesting Chips Ahoy side. I like how the caramel accentuates the cookie dough flavoring while at the same time we aren't distracted by a fudge swirl like we were in the original Chips Ahoy Blasts. Man the Oreo component is just so weird. I swear I want to like it but there's just this odd funk to it and it makes me never want to eat that side again... ok, my daughter is having some now and she says it's not that bad. Great, now I can pawn it off on her! On Second Scoop: Ok, I cheated and headed for the dwindling caramel side because Breyers thought why bother including an even split of both flavors.... I still like this idea, but just the idea, not the execution. Maybe I'll move to Canada where you can buy containers of just the Chips Ahoy side (seen here) though unfortunately it is a frozen dairy dessert as well). Oh, I can describe the Oreo funk now. It reminds me of skim milk which is not a good thing in ice cream (I don't know about you, but I hate skim milk). Proceed with caution. If you can recall, did the Oreo Blast part taste different than the solo/original Oreo Blast released a few years ago? It wasn't my favorite of these (and probably didn't taste like it should have), but I don't recall it being particularly weird for the Blasts line. Wonder why they switched from cookie flavored frozen dairy to caramel for the Chips Ahoy Blasts; caramel isn't really a flavor I associate with either type of cookie. Will still give it a try if it ever shows up in my area (we still have the normal Oreo Blasts available, not even on clearance yet) with lowered expectations. I actually never tried the plain Oreo blasts, just the chocolate and mint versions. That said, I'm going to update the review because I realize that I can describe the funk now. It tastes like skim milk to me. Some people like skim milk but I despise it. I think "cookie flavor" was basically a mild brown sugar flavoring which you couldnt really detect much with everything else going on. I think if you dial the caramel in right, it can be a positive with the cookies. I don’t know why people waste their money on Breyers personally. To me they’re terrible. This guy did a YouTube video where he left a container out overnight and it never melted. So many stabilizers and food science these days. Bleck. 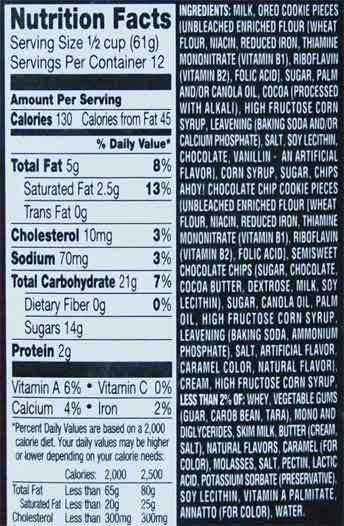 "Chips Ahoy" are far from super premium cookies, so I can see why we've never seen them in super premium ice cream. I'd go as far to say that they are the FDD of cookies. 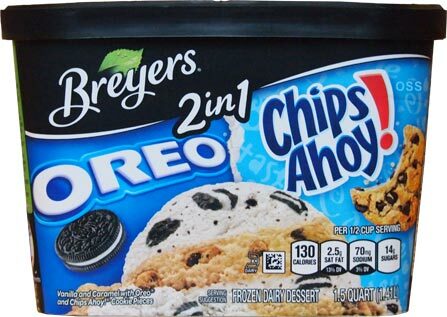 In fact when I first saw these Breyers 2 in 1s I thought "Well, Breyers knows they can't hold a candle to Ben & Jerry's or Turkey Hill, so they must try to appeal to kids now." But I'll agree that caramel ice cream with chocolate chip cookies and/or chocolate chip cookie dough in it, sounds like an awesomely decadent idea. As for FDD in general : I only buy it if it's in novelty treat form, which is the only time it ever makes some sense. Novelty treats are meant to be eaten kind of quickly so they don't melt all over you. But to sit down to a bowl of it? hahahahaha, no, chips ahoy are definitely not super premium, but I would like to see the concept of a good crunchy chocolate chip cookie in a super premium caramel ice cream. 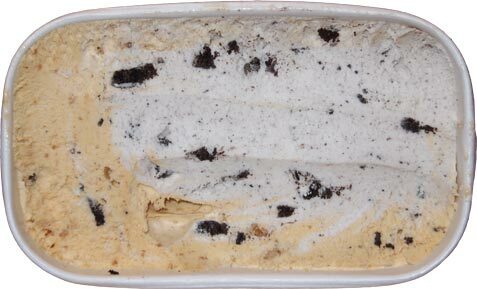 we've gotten an oreo like cookie swirls so maybe a chocolate chip cookie swirl too if you really wanted to get crazy.